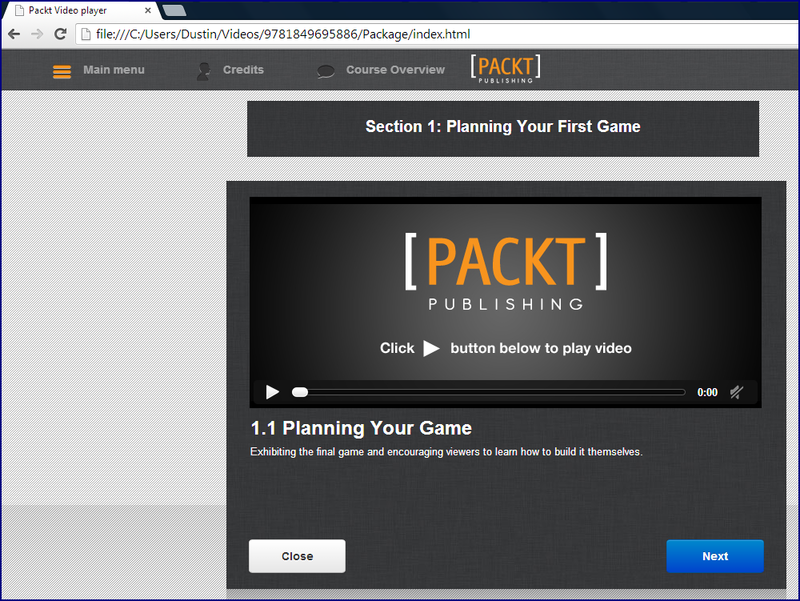 Packt Publishing recently invited me to review the recently released video HTML5 Game Development by Makzan (http://makzan.net/). I hesitated initially to accept this offer because I've typically preferred reading text (books, blogs, and articles) over watching videos and podcasts for learning new technical concepts. However, after viewing the HTML5 Game Development video, I'm glad that I accepted that offer. 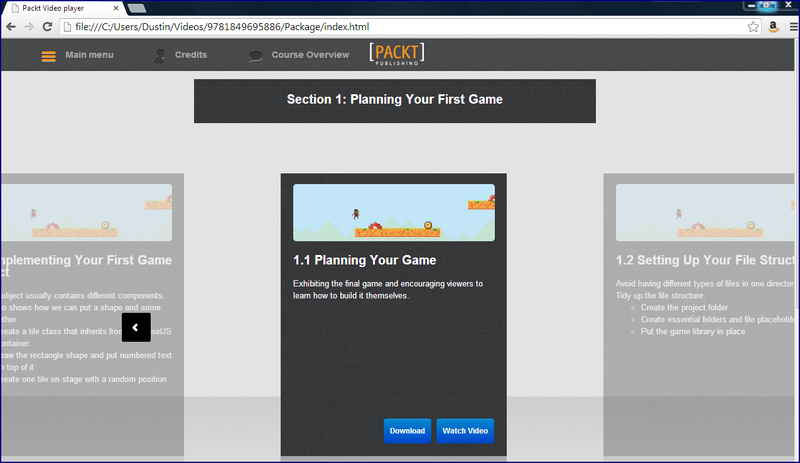 The HTML5 Game Development video, once downloaded, can be viewed in a web browser via the Packt Video player. The next screen snapshot demonstrates this for the first section of the video. The HTML5 Game Development video is a series of short video clips ranging from a little shorter than 2 minutes to a little longer than 4 minutes each. These videos are categorized by "section" (sections are referenced as "chapters" in navigation buttons) and the next screen snapshot shows the first, second, and last (eighth) sections. The one in the middle (Section 1 in this case) is the Section whose video snippets would be viewed when the "Browse Videos" button is clicked. When a Section (or Chapter) is selected, multiple short videos are made available. An example of this is shown in the next screen snapshot. Click on "Watch Video" allows one to start watching the specific video. 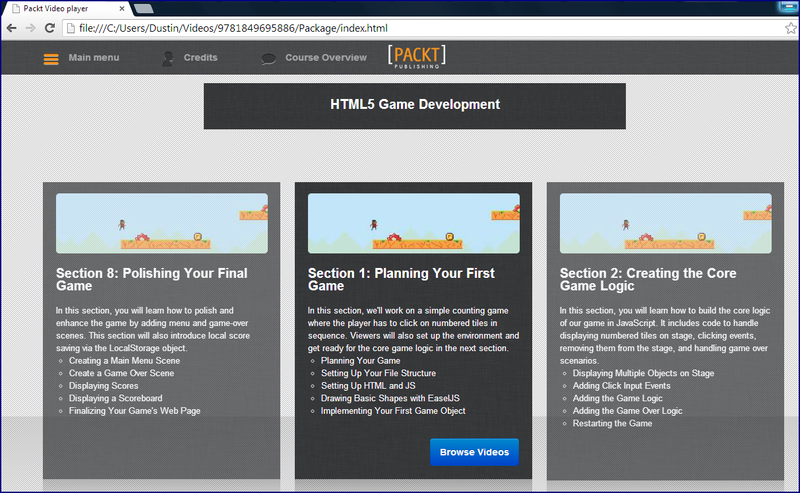 I have taken the time in this post to depict this presentation of the short video snippets because there are some advantages to the HTML5 Game Development video being available in this format. The short videos allow easily digestible amounts of information to be seen in just a few minutes. Objectives for each video snippet are outlined before the video snippet and then are addressed in the video snippet. With such short video snippets available and with clear objectives outlined before each video, it is easy to pick and choose which portions to watch more than once. An effective way of viewing this overall video might be to first watch the video snippets once through and then return to those of most interest are those that need to be seen again. The overall video length is advertised as just under 2 hours. This is divided into eight chapters/sections ranging from 12+ minutes each to 17+ minutes each. With each chapter/section having 5 videos, these videos range from 1 minute to 4 minutes each. 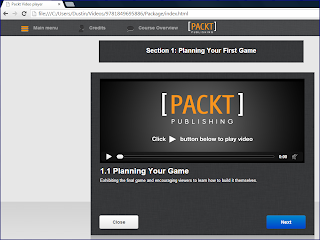 The Packt HTML5 Game Development Video Table of Contents outlines the eight chapters/sections, the five videos per chapter/section, and the total duration of each chapter/section. The O'Reilly page for this video breaks down each of the five videos in each of the eight chapters/sections by their individual durations (to minutes granularity). 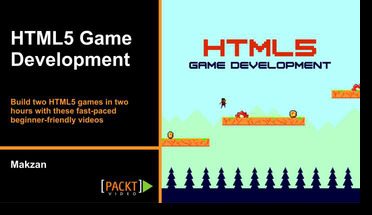 HTML5 Game Development depicts application of several interesting products. Its use of Sublime Text makes it easy to read the code thanks to color coded syntax on a dark background, line numbers, code completion, and keyword matching capabilities. The video also uses Sloppy and the iOS Simulator to help demonstrate adjusting the developed games to run on mobile devices. The video also demonstrates using free tools available online to secure fonts and make them presentable on the web. Another example is the video's demonstration of using Zoë to covert Flash animation to sprite sheets (.png and .json files) and then applying those with EaselJS Sprite Sheet Animations. The videos demonstrate quite a bit in the two hours. The narration is quick and the code editing in Sublime Text is quick thanks to significant copying-and-pasting that occurs in synchronization with the narration. I enjoyed the relatively fast pace because I didn't have a chance to lose interest or get bored. However, I was glad that I had used HTML5 technologies previously because a lot of content was covered so rapidly. For viewers with less experience with these technologies, the short videos provide the opportunity to easily re-watch parts that need more than one viewing and possibly mix viewing of those parts with reading other more introductory resources. 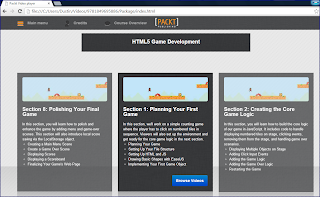 There are a few things to note to get the most out of "HTML5 Game Development." Although video 6.2 is called "Applying Gravity to the Hero", it actually talks about running hero and moving camera instead of falling hero. On the other hand, video 6.3 is called "Making the Hero Run" but talks about making the hero stop falling on the platform rather than falling through it. These videos, at least in my download, were switched in order. To see full screen (which is particularly important with the code editing video), click on the square to the right of the video progress bar and volume control when mouse cursor is over video in the Packt Video Player. The audio in HTML5 Game Development is clear and the woman narrating the video speaks in a clear manner and enunciates well (and I liked the accent). The Preface further reinforces the point that this book is not for beginners when talking about the book's objective: "Whether you are an intermediate- or advanced-level Backbone.js developer, this book will guide you through the best practices and patterns to handle different issues with each Backbone component." The initial chapter of Backbone.js Patterns and Best Practices introduces the basics of Backbone.js and provides short descriptions of Backbone.Model, Backbone.View, Backbone.Collection, Backbone.Router, and Backbone.Events. The first chapter introduces the Underscore.js utility and mentions that "Backbone.js has a hard dependency on Underscore.js." The author also mentions Lo-Dash as an Underscore.js alternative. The core coverage of this initial chapter is on reusing code by extending (with and without a base class) and using mixins. The second chapter also introduces Marionette.js, which it describes as "a composite application library for Backbone.js." The focus is on Marionette's ItemView, CollectionView, and CompositeView. Chapter 2 moves finishes with coverage of backbone.layoutmanager as an alternative to Marionette RegionManager. Backbone.js Patterns and Best Practices's third chapter discusses working with Backbone models. The chapter begins by outlining the basics of Backbone models and how to use Backbone models with an emphasis on CRUD (create/read/update/delete) operations. Model validation is covered next with examples of using direct Backbone model validation as well as using Backbone.Validation. Chapter 2 covers serialization of Backbone models and using Backbone-relational.js for relational data work with Backbone. Chapter 4 of Backbone.js Patterns and Best Practices defines a Backbone collection as "an ordered set of models" that includes "functionality to add, remove, sort, and filter models, and save to or fetch data from the server." The chapter includes a brief overview of Backbone collections before moving onto describing how to perform database-related operations on a Backbone collection. Sorting and filtering of Backbone collections are also covered in the fourth chapter. The fifth chapter in Backbone.js Patterns and Best Practices describes a Backbone router as a mechanism that matches a "URL fragment" to an invoked method. The chapter provides an overview of Backbone routers and routing before moving onto coverage of "best practices for working with routers." In the course of this discussion, the author references Marionette.AppRouter and Marionette.Controller. Sub-routing is described in Chapter 5 and the extension backbone.subroute is specifically referenced. Chapter 6 of Backbone.js Patterns and Best Practies covers "custom events, Backbone.sync() method and Backbone.LocalStorage." The portion of the chapter on events begins with a definition of events from the Backbone.Events API page. This section demonstrates how easy it is to create custom events in Backbone, contrasts use of Events to use of Callbacks, and provides a case study describing use of events. The section of Chapter 6 on Backbone.LocalStorage discusses and demonstrates use of Backbone.localStorage Adapter before mention an alternative called Backbone.dualStorage. As its title suggests, Chapter 7 of Backbone.js Patterns and Best Practices discusses issues related to application structure, optimization, and deployment of Backbone-based applications. The author proposes an application directory structure which "is not something that will work universally for every application," but "lots of developers use it for their projects without any issues." One of Chapter 7's main themes is Asynchronous Model Definition and using Require.js to add AMD support to a Backbone application. Appendix A includes the author's recommendations for three books on Backbone.js along with recommended online tutorials and blog posts on Backbone.js. This appendix also includes references to additional resources on testing Backbone-based applications with QUnit and SinonJS as well as references to more Backbone plugins and tutorials. Although two chapters earlier in Backbone.js Patterns and Best Practices discuss AMD and Require.js briefly, both chapters reference Appendix C for additional details. The example in this appendix is built on top of requirejs-tpl. My most important observation is that the implication of Backbone.js Patterns and Best Practices's title and the explicit statements in its Preface that the book is targeted at intermediate Backbone developers should not be taken lightly. Although the book does provide some brief introductory material on most of the subjects it covers, at least some familiarity with the basics of a Backbone.js-based application would be extremely beneficial in realizing the full value of reading this book. There are not many images or screen snapshots in this book, but these are not particularly important to the content. Even in the PDF version of Backbone.js Patterns and Best Practices that I reviewed, the code listings are black text on white background with no color syntax. Most of the code listings are short enough to mitigate the issue, but color-coded syntax would be easier to read. Backbone.js Patterns and Best Practices is written with the intent to discuss issues that the author believes developers frequently run into when developing Backbone-based applications. Test-Driven Development with Mockito provides a general introduction to test-driven development (TDD) before looking at application of Mockito to implement test doubles as part of test-driven development. Test-Driven Development with Mockito is written by Sujoy Acharya, is published by Packt Publishing with a publication date of November 2013, and has about 150 substantive pages of substantive content divided into 9 chapters and 2 appendices. The subtitle of Test-Driven Development with Mockito is "Learn how to apply Test-Driven Development and the Mockito framework in real life projects, using realistic, hands-on examples." Test-Driven Development with Mockito's Preface opens with a very brief description of test-driven development and how Mockito plays a role in test-driven development. The preface summarizes each chapter and appendix before recommending what a reader of that book should use while reading the book: J2SE 5, the Eclipse IDE (Kepler 4.3 recommended), and Mockito. This book is for developers who want to develop software according to Test Driven Development using Mockito and to leverage various Mockito features. Developers don't need prior knowledge of TDD, Mockito, or JUnit. It is ideal for developers who have some experience in Java application development as well as some basic knowledge of unit testing, but it covers the basic fundamentals of TDD and JUnit testing to get you acquainted with these concepts before you use them. As the Preface stated, Test-Driven Development with Mockito does cover "basic fundamentals of TDD" and begins this in the first chapter. This chapter starts out at a very basic level, defining a test in Java development and listing some "available code-driven unit-testing frameworks for Java." In this chapter, we learn that JUnit 4.0 will be used in examples in the book. An example is then presented using Eclipse and JUnit in which the test class is written before the production class. This transitions into more details on the historical background of TDD and lists benefits of TDD. Chapter 1 continues by looking into how TDD fits into overall software development and how refactoring plays a role in test-driven development. In many ways this first chapter is what you'd expect from a book on test-driven development. The code-based examples of test-driven development do a nice job of illustrating basic techniques and advantages associated with test-driven development. However, there seemed to be some things that seemed a bit out of place in this chapter. In particular, the chapter's extremely brief coverage of "Object-function programming languages such as Scala and Groovy" seemed irrelevant to the rest of the chapter and added little value. As with most books on TDD, this chapter of this book had a paragraph that seemed a bit preachy. The second chapter of Test-Driven Development with Mockito, as its name implies, focuses on refactoring. The chapter begins by reviewing benefits of refactoring and then discusses "trigger points for refactoring" and when not to refactor. Some relatively lengthy code listings are provided to show some code in desperate need of refactoring with text explaining issues with the code and possible ways to refactor that code. This section of the book also introduces the Eclipse plugin CodePro Analytix. The second chapter moves onto coverage of code smells. Duplicate code with switch statements is shown as a code smell and there is discussion and more code listings on how to refactor this using the strategy pattern and polymorphic behavior. Other code smells that are covered in this chapter along with potential remedies include duplicate code, comments, long methods, long method parameter lists, large classes, dead code, and overengineering. This second chapter is a reasonable introduction to code smells and how to use refactoring and other techniques to deal with them. This chapter mentions common object-oriented and software development principles such as YAGNI, DRY, open-closed principle, and strategy pattern. A single chapter of a book cannot compete with an entire seminal treatment of a subject, but this chapter does provide a good illustration of how refactoring fits into TDD. The third chapter of Test-Driven Development with Mockito begins with a bold statement, "Test-Driven Development (TDD) is the new way of programming." The chapter then outlines the simple steps that are taken to implement TDD and is the first chapter in the book to really dive into TDD. The chapter concludes with a lengthy example including code listings and Eclipse screen snapshots to demonstrate JUnit and TDD in practice. Chapter 4 of Test-Driven Development with Mockito compares and contrasts TDD's two "common" styles: Outside-In and Inside-Out. The chapter provides details regarding the outside-in approach before listing advantages and disadvantages of that outside-in approach. The same is then done for inside-out, though the coverage is much shorter than for outside-in. Test-Driven Development with Mockito's fifth chapter covers test doubles. The chapter very briefly discusses why test doubles are useful (I don't think this part is particularly strong) before categorizing the types of test doubles (dummy, stub, mock, and fake). The coverage of these types of test doubles is much better than the general introduction to test doubles and provides nice code examples and discussion on each and how they are different. Chapter 6 of Test-Driven Development with Mockito is the book's first significant look at Mockito (although Mockito was mentioned in Chapter 5 for the example of the mock category of test double). The chapter begins with an overview of Mockito and explains Mockito's primary roles in test-driven development: "Mockito plays a key role to mock out external dependencies" and helps achieve the desired "qualities of unit testing." Chapter 6 continues by demonstrating adding Mockito to Eclipse. There are numerous screen snapshots of Mockito being used within Eclipse (these are in color in the electronic edition of the book). The chapter introduces key annotations and functionality provided by Mockito and demonstrates using Mockito to address things commonly tested using mocks. A reader of this book who's primary interest in the book is learning Mockito would find this to be one of his or her favorite chapters of the book. Test-Driven Development with Mockito's seventh chapter begins with a brief discussion of classical TDD versus mockist TDD. The chapter is then introduced with the statement that it will "use Mockist TDD style to mock external dependencies and explore Test-Driven Development." 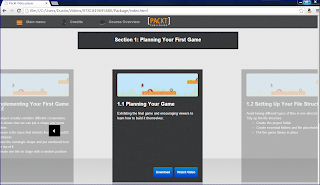 The entire chapter is then devoted to a fairly realistic example of building an "online portal for the aspiring game developers" with test-driven development techniques and using Mockito to mock out the external interfaces. Chapter 8 of Test-Driven Development with Mockito opens with reference to Robert Martin's "three important characteristics of a bad design": rigidity, fragility, and immobility. The chapter then covers "higher level design guidelines" of modularity, high cohesion, and low coupling and "lower level design principles" of Open/Closed Principle, Dependency Inversion Principle, Integration Segregation Principle, Single Responsibility Principle, Liskov Substitution Principle, and the Law of Demeter. The next section of Chapter 8 discusses design patterns. The section provides an overview of what design patterns are, how they are categorized, and provides a couple of examples of applying design patterns. The ninth chapter of Test-Driven Development with Mockito discusses what constitutes legacy code and then emphasizes: "Any code with no unit test is legacy code." Chapter 9 looks at some common less-than-testable features of legacy code and how to refactor that code for greater testability. The chapter then moves onto how Mockito can make it easier to refactor code to be more testable. Appendix A covers Eclipse IDE and JUnit 4 unit testing framework. It discusses using keyboard shortcuts in Eclipse (including "The mother of all shortcuts is Ctrl + Shift + L" to see all shortcuts) and emphasizes those shortcuts useful in refactoring and TDD. There are some nice color screen snapshots showing shortcuts applied in this section. Appendix A's coverage of JUnit begins with the statement, "Inheritance in Java is not a smart thing to implement" to explain advantages of JUnit 4.x (which supports annotations) over earlier versions which required inheritance. Appendix A's coverage of JUnit covers fundamentals of JUnit and demonstrates using Eclipse shortcuts in JUnit unit test development. Appendix B discusses continuous integration (CI) in general before covering Jenkins as a particular continuous integration tool. The author begins continuous integration coverage with the statement, "In a good software development team, we'd find TDD as well as CI." There are numerous color screen snapshots depicting configuration of Jenkins. Appendix B also discusses the "Agile development methodologies Scrum and Kanban." After briefly discussing Agile in general and providing a reference to the Agile Manifesto, Appendix B focuses on Scrum and Kanban specifically. Test-Driven Development with Mockito attempts to cover numerous topics within its roughly 150 pages. The title nicely captures two of the most significant topics of the book: Test-Driven Development and Mockito. It is important to note that this book is on both subjects, among others, and is not exclusively a book on test-driven development or exclusively a book on Mockito. Topics related (in some cases less tightly than others) to test-driven development that are covered in this book include refactoring, object-oriented design practices and principles, and agile methodologies. The advantage of this coverage of a wide set of somewhat related topics is that a developer new to test-driven development can get an introduction to a wide variety of related topics. The disadvantage of this approach is that there is less depth on any one subject that books more tightly focused might have. To this point, note how long each of the books listed below is in terms of the single topic each book covers. Each of these books is lengthier on a single topic than Test-Driven Development with Mockito is for all of the topics. Test-Driven Development with Mockito allows a reader to get a taste of each of these topics and how they fit together in a single book, but thorough coverage of the topics would need to be gained by moving onto these specifically focused books. Martin Fowler's Refactoring: Improving the Design of Existing Code has over 450 pages devoted to refactoring. Kent Beck's Test-Driven Development: By Example has well over 200 pages. Design Patterns: Elements of Reusable Object-Oriented Software has over 400 pages. Robert Martin's Clean Code: A Handbook of Agile Software Craftsmanship is over 450 pages in length. Tomasz Kaczanowski's Practical Unit Testing with JUnit and Mockito has over 400 pages. Lasse Koskela's Effective Unit Testing: A Guide for Java Developers has almost 250 pages. Test-Driven Development with Mockito has several nice images. I especially like the screen snapshots that depict Eclise refactoring keyboard shortcuts and the screen snapshots that depict Jenkins configuration. An advantage of my reviewing the PDF provided by Packt Publishing is that these images are in full color. The code listings are useful in illustrating the points being made, but the lack of color syntax (even in the electronic PDF version) make it more difficult to read the code quickly and easily. I have become spoiled by my IDE (and even my vim!) and online code listings featuring color syntax. Reading code without color syntax reminds me of the "old days," but the nostalgia is not worth the extra effort required to read the code. Test-Driven Development with Mockito has some typos in it and also has some awkward and incomplete sentences. However, none of these were significant enough to prevent me from picking up the concept being covered. Although the flow of topics covered in Test-Driven Development with Mockito generally made sense, there were some aspects of the arrangement of the various concepts that were a bit awkward. In particular, there were a couple concepts that were presented in almost a "side note" manner at first and were not very clearly explained, but then were much more clearly explained in the later sections that focused on that topic. As is the case with just about every TDD-related book I have read, Test-Driven Development with Mockito is a highly opinionated book. Although I generally agreed with most of the opinions, I felt some of the stated opinions were backed up better than others and some I don't feel quite as strongly about or think are quite as certain as the author does. That being stated, I do like to see opinions expressed and I generally agreed with them in principle. The more focused books I mentioned in an earlier bullet would be useful for the reader of Test-Driven Development with Mockito who wanted to better understand the "why" behind some of the opinions expressed in this book. Test-Driven Development with Mockito will be most beneficial to readers who have little to no familiarity with the numerous concepts introduced in the book (test-driven development, refactoring, object design, JUnit, Mockito, etc.). The book provides an overview of each of these and how they are used together. Developers who have read other books on these subjects may not find the introductory information in Test-Driven Development with Mockito as useful or as new to them. Developers wanting in-depth coverage of a topic might prefer a book focused on that particular topic. The book is most useful for those using the Eclipse IDE, but many of the sections are useful for developers who don't use Eclipse. 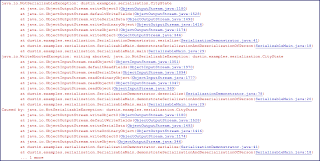 There are multiple reasons one might want to use custom serialization instead of relying on Java's default serialization. One of the most common reasons is for performance improvements, but another reason for writing custom serialization is when the default serialization mechanism is unsupported. Specifically, as will be demonstrated in this post, custom serialization can be used to allow a larger object to be serialized even when attributes of that object are not themselves directly serializable. The next code listing shows a simple class for serializing a given class to a file of the provided name and for deserializing an object from that same file. I will be using it in this post to demonstrate serialization. * Serialize the provided object to the file of the provided name. *     implementation as that is used by this method for writing our status. * @param fileName Name of file to which object is to be serialized. * @throws IllegalArgumentException Thrown if either provided parameter is null. * @param <T> Type of object to be deserialized. * @param fileToDeserialize Name of file from which object is to be deserialized. *    this method's status output. *    provided class; may be null if something goes wrong with deserialization. The next code listing illustrates use of the SerializationDemonstrator class to serialize and deserialize a standard Java string (which is Serializable). 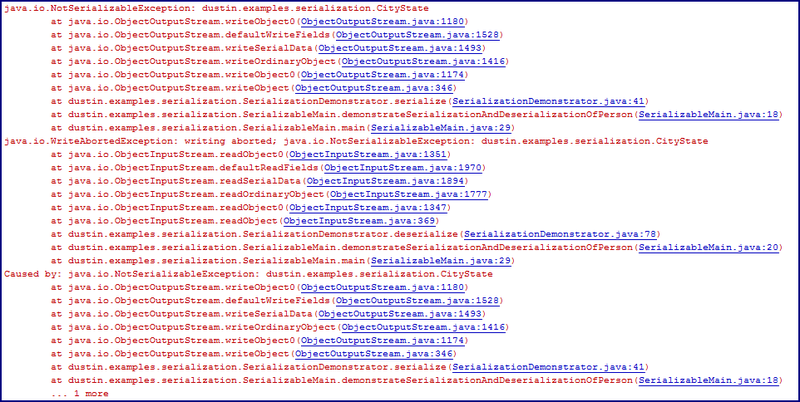 A screen snapshot follows the code listing and shows the output (in NetBeans) of running that String through the serialize and deserialize methods of the SerializationDemonstrator class. The next two code listings are for the class Person.java and a class that it has as an attribute type (CityState.java). Although Person implements Serializable, the CityAndState class does not. * Simple class storing city and state names that is NOT Serializable. The next code listing demonstrates running SerializationDemonstrator on the serializable Person class with a non-serializable CityState. The code listing is followed by a screen snapshot of the output in NetBeans. In this case, the CityState class is my own class and I could make it Serializable. However, supposing that this class was part of a third-party framework or library and I was not able to change the class itself, I can change Person to use custom serialization and deserialization and work with CityState properly. This is shown in the next code listing for the class SerializablePerson that is adapted from Person. * @param out Target to which this instance is written. * @throws IOException Thrown if exception occurs during serialization. * Deserialize this instance from input stream. * @param in Input Stream from which this instance is to be deserialized. * @throws IOException Thrown if error occurs in deserialization. * @throws ClassNotFoundException Thrown if expected class is not found. The above code listing shows that SerializablePerson has custom writeObject and readObject methods to support custom serialization/deserialization that handle its attribute of unserializable type CityState appropriately. A snippet of code for running this class through the SerializationDemonstrator and the successful output of doing so are shown next. The approach depicted above will allow non-serializable types to be used as attributes of serializable classes without the need to make those fields transient. However, if the CityState instance shown earlier needs to be used in multiple serializable classes, it might be better to decorate the CityState class with a serializable decorator and then used that serialized decorator class in classes needing to be serialized. The next code listing shows SerializableCityState which decorates CityState with a serialized version. * decorates the non-Serializable CityState class and adds Serializability. This serializable decorator can be used in the Person class directly and that enclosing Person can use default serialization because its fields are all serializable. This is shown in the next code listing for Person2 adapted from Person. This code can be executed as shown in the next code listing, which is followed by its output as seen in the NetBeans output window. Custom serialization can be used to allow a class with attributes of nonserializable types to be serialized without making those attributes of nonserializable type transient. This is a useful technique when serializable classes need to use attributes of types that are not serializable and that cannot be changed. ObjectStreamClass can be a useful class to analyze the serialization characteristics of a serialized class loaded in the JVM. This post looks at some of the information this class provides about a loaded serialized class. ObjectStreamClass provides two static methods for lookup of a class: lookup(class) and lookupAny(Class). The first, lookup(Class), will only return an instance of ObjectStreamClass when the provided class is serializable and returns null if the provided class is not serializable. The second, lookupAny(Class) returns an instance of ObjectStreamClass for the provided class regardless of whether it's serializable or not. Once an instance of ObjectStreamClass is provided via the static "lookup" methods, that instance can be queried for class name, for serial version UID, and for serializable fields. To demonstrate use of ObjectStreamClass, I first list the code listings for two simple classes that will be part of the demonstration. One class, Person, is Serializable, but has a transient field. The other class, UnserializablePerson, is nearly identical, but it is not Serializable. * Person class intended for demonstration of ObjectStreamClass. With two classes in place to run use in conjunction with ObjectStreamClass, it's now time to look at a simple demonstration application that shows use of ObjectStreamClass. * Demonstrates use of ObjectStreamDemo. * indicated by the provided instance of ObjectStreamClass. * Main function that demonstrates use of ObjectStreamDemo. * @param arguments Command line arguments; none expected. //            case of a class that is not serializable. The comments in the source code above indicate what is being demonstrated. The output from running this class is shown in the next screen snapshot. When the output shown above is correlated with the code before it, we can make several observations related to ObjectStreamClass. These include the fact that the transient field of a serializable class is not returned as one of the serializable fields. We also see that ObjectStreamClass.lookup(Class) method returns null if the class provided to it is not serializable. ObjectStreamClass.lookupAny(Class) returns an instance of ObjectStreamClass for classes that are not serializable, but only the class's name is available in that case. The code above showed a Serial Version UID for Person.java of 1940442894442614965. When serialver is run on the command line, the same Serial Version UID is generated and displayed. What's nice about the ability to programatically calculate the same Serial Version UID as would be calculated by the serialver tool that comes with the Oracle JDK is that one could explicitly add the same Serial Version UID to generated code as would be implicitly added anyway. Any JVM-friendly script or tool (such as one written in Groovy) that needs to know the implicit Serial Version UID of a class could use ObjectStreamClass to obtain that Serial Version UID.